1. Why are the children's channels under the adult section? The children's channels are now allocated the range between 200 and 229. Immediately above, channels 170-199 used to be allocated to adult channels. Providing users have retuned correctly (see question 2), the services in the range 170-199 are inactive, with just a slate redirecting viewers to the new locations. These slates will be removed soon (see question 3). Admittedly, it might have been a little more clearer if the bookends for the former adult section on channels 170 and 199 had been actually relabeled "former adult section". 2. 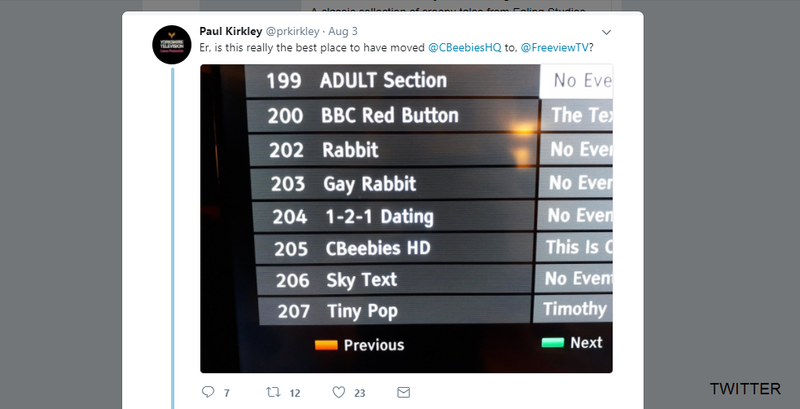 Why has Freeview put CBeebies within adult channels? If you believe some newspapers, that actually happened, and some Tweets seem to prove that. However, this appears to be a retune error rather than that of Freeview or the BBC. Why can we say this with certainty? Look at the screenshot: Sky Text closed on Freeview on 30th October 2013. Rabbit and Gay Rabbit were removed from Freeview in November 2015. The problem is that some receivers, especially some older ones, as well as some made by Panasonic, have a retuning mode that allows viewers to easily add channels, but importantly, it won't remove defunct channels. As a result, when a service moves to a channel number that was used in the past by another service - the receiver won't overwrite the previously stored channel with the new one. (This tends to force channels into the 800s in your channel list.) How did CBeebies HD get there? Its new channel number 205 hasn't been used since the end of 2012, and the receiver in question was either last fully retuned or installed for the first time at some point between the end of 2012 and autumn 2013. The solution is to find the option in the menu that triggers one of the following (varies depending on make / model): 'factory reset' ; 'first time installation' or a 'full retune'. This will wipe the entire channel list, including all defunct channels, and allow the receiver to store Freeview's current channel line-up with services in the correct order. Newer devices that are compatible with Freeview Play automatically adjust the channel list, so you don't get this issue. 3. When are all these "channels have moved" slates going to be removed? The BBC's Senior Distribution Manager Neil Walker says the the holding slides for BBC services will be removed after two weeks. Freeview has been advising users on social media that the adult redirect slates will be there until early September. 4. When will I be able to watch the correct regional version of BBC One / ITV in HD on Freeview? The infrastructure that supports the HD versions of the main five channels isn't yet set up for full regionalisation. This means that in Anglia, Tyne Tees, Westcountry and Yorkshire TV regions, the relevant regional version of ITV HD isn't yet available on Freeview (even though they are available on Sky and Freesat). As far as the BBC services are concerned, there are plans, but no currently published public timescale of when it intends to start regionalising BBC One in England. In Scotland, Wales and Northern Ireland, it's BBC Two HD which isn't localised to the nations. 5. Why was a channel shuffle needed? There's loads of gaps in the channel numbering! 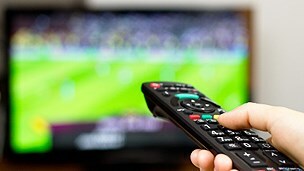 There is an increasing number of channels only available on a local or regionalised basis; also channels that depend on a newer type of Freeview receiver (one that supports Freeview HD or Freeview Play, for example). For example, True Crime on channel 60 will only appear if you're in an area where there's a local TV service on channel 7 or 8, as True Crime piggybacks on the local TV signal. Channel 82 (Vintage TV) will only appear if you have a newer Freeview receiver and live in the range of the signal. So the gaps you may see don't necessarily mean the channel numbers haven't been allocated for use somewhere else in the UK. 6. Where's Talking Pictures on Freeview? There's an increasing amount of interest about watching Talking Pictures on Freeview (channel 81). Current coverage reaches around 75% of households. Only newer devices support reception of the service: you need a device that supports Freeview HD or Freeview Play. YouView (BT / Plusnet / TalkTalk TV) and EE TV boxes will also do the trick. In London, for example, you need to be receiving a TV service from the Crystal Palace transmitter, and not any of the local relays. A similar situation applies in other parts of the UK. There's no reception possible via Freeview in many parts of Suffolk, North Scotland, Mid Wales, SE Kent or North Devon, to name some not-spots. You can check if you're in the coverage area by visiting the Digital UK coverage checker. In some areas, Talking Pictures is relayed on the local TV channel during the day. 7. What's Freesports all about? 8. Is Quest+2 coming to Freeview? (updated 07/08/2017) Originally signposted by Digital UK as coming to Freeview channel 84 on the 2nd August, the appearance of the channel was postponed. A licence for the service was added to Ofcom's database, and then removed again, so it is currently unclear if Discovery will be taking an additional Freeview slot or not. 9. Will there be any further channel changes soon? It is likely that some channel changes will be made soon to fill in gaps currently left in the channel guide at 90 and 91. 10. I'm in Northern Scotland, I've seen messages that tell me I've got to retune again. Is this true?